Fat Twist Outs are the BEST Twist Outs! So what is the difference between the two? You will find out. For one, I rock my au naturale hair for about a month in between crochet braids styles (mostly to give it a rest from hanging synthetic hair from it - no tension! and to re-condition it properly when it is not in cornrows all the time). With that said, it is definitely the most difficult time for me during that natural hair only month, finding ways to making my hair look fresh day to day! So the lazy busy side of me mostly curls fat twists to do a fat twist out! So I have been basically been doing this method forever only because it is easy to put on a hat/hoodie and go about your day. I also always start my curling adventured with big ol' fat twists. After coating each fat twist with some pomade and then adding the curling solution, I basically just curly it up and turn the foam rod curlers in, so all the curlers are nicely tucked in on my head. I usually let it dry during the day naturally but because my hair is thick and takes forever to dry, I sometimes sit under a hooded dryer for 30+ minutes to accelerate the process. I also never sleep in them (because you won't be getting any sleep with those thangs). I usually take them out before bed and pin them down and wake up and they are ready to do. As you can see in the video the style only last for about two days. After that the crinkle might still be there to your curl but the actually ringlet itself might have already fallen out. Ok I literally saw this done about a few weeks ago on instagram and I was thinking...hmmmm, let's see what this will do to my hair! The process is generally the same for me - start with some fat twists, apply shine pomade and curling product and then curling it on the foam rod but instead of tucking in your foam rod curlers, you wrap the hair in a downwards spiral and have them hooked at the start of you hair to prevent slippage. The drawback to this is that this mess is in your face all day. Of course you can accelerate the process by sitting under a hooded dryer but it's hard to go run errands with these things sticking out under a hat or hoodie. The results were great, mostly because it gives a stretch to your curl. It only lasts about two days as well, becoming more of a crinkle in the end instead of a downward ringlet. Also this look was inspired by something I saw on instagram and using perm rods! I have used perm rods before but I thought for the purposes of this comparative experiment to try it on this curl fro-hawk inspired look. I basically parted my hair into three sections, made about 3-4 fat twists per section, applied the pomade and curling product to it, then curled each fat twist with a perm rod. This was somewhat easy to hide if you are trying to dry it all day. I just wrapped it up with a scarf and went to practice (zero fux given here obviously). 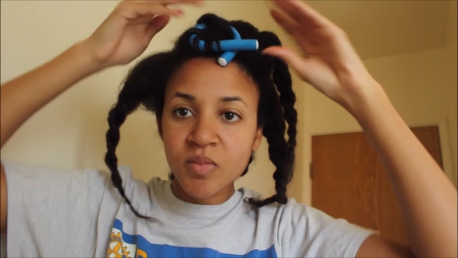 I took out the perm rods before I went to bed and pinned them down and wrapped up my hair. The curls are much more tighter and more like a Shirley temple curl. The style lasts less than foams rods for some reason, not sure why. Maybe because the curl is tighter and becomes kind of like a nebulous puff ball after about 48 hours.